With Pala Presents, we offer selections from the library of Pala International’s Bill Larson, who shares with us some of the wealth of information in the realm of gems and gemology. 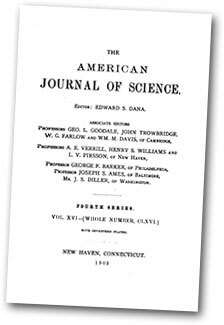 The following article was published in the The American Journal of Science, Vol. XVI—[Whole Number, CLXVI], No. 93, September 1903, 264–267. A MOST remarkable discovery of unaltered lilac-colored spodumene has lately been made in California. The crystals were obtained fifty feet from a deposit of colored tourmaline, itself of notable interest, a mile and a half northeast from Pala, in San Diego County. This new discovery is but half a mile northeast from the celebrated rubellite and lepidolite locality at that place, where recent developments have brought to light immense quantities of amblygonite,—this latter species occurring by the ton, while the lepidolite is estimated by the thousand tons. The locality is thus unequalled in the world for its abundance of lithia minerals. The rubellite crystals found here are entirely embedded in lepidolite, and until recently it was found impossible to remove them to show their complete form. They were, however, often polished with the lepidolite,—the rubellite appearing as pink radiations in a darker gangue of lilac-colored lepidolite. Recently, however, the crystals of rubellite have been rubbed out, as it were,—made to stand out by removing the lepidolite matrix by means of brushes and cleaning tools,—forming most beautiful groups of crystals. At the new locality, colored tourmaline crystals have been found that are remarkable in size and beauty, although they are much broken in taking them out. Some are a foot long and three inches in diameter, with a red central core (rubellite) and a blue exterior (indicolite) separated by a pale intervening zone. Other pink crystals have a blue cap or termination; the blue color in these specimens is a deep shade, inclining toward purple. One very remarkable large crystal is like a hollow cylinder, apparently composed of a group of prisms surrounding an open central space at the axis of the cluster; this is entirely of a rather dull blue, verging toward reddish in the interior. The spodumene crystals are beautiful in their color tones, varying from deep rosy lilac at some depth to pale or almost colorless, doubtless due to weathering or to the action of sunlight,—in striking contrast to the rich deep pink-purple found at a greater depth. These crystals are extraordinary objects to the eye of the mineralogist; to see flat spodumenes of characteristic form, as large as a man’s hand, but with bright luster and perfect transparency, and of this rich delicate pink-amethystine tint, is a novel and unlooked for experience. The localities of these remarkable tourmalines and spodumenes are near the top of a ridge lying from a mile to a mile and a half from the lepidolite ledge of the old Pala locality, and separated from it by a valley some 900 feet deep. The ledge in which these new minerals occur is on the west side of this ridge, and has been traced for 1,200 feet in a N.W.–S.E. direction. The description given of it suggests a large dike. The rock is a coarse decomposed granite (pegmatite? ), the feldspar much kaolinized and reduced to a “red dirt,” and with many large quartz crystals, some of them reaching 150 pounds in weight, but not clear. The Meridan (?) crystals were found in a deserted and abandoned gold mine. The rock is an iron-stained granite, and the crystals occur in a vein of quartz with gold, rutile, black oxide of manganese, epidote, orthoclase, “mica,” lepidolite, cookeite and black tourmaline. The mineral was not recognized until sent to the writer in New York, having been pronounced tourmaline by parties to whom it was shown; and many crystals were ruined by lapidaries in the unsuccessful attempts to cut them, as the very highly facile cleavage of spodumene causes it to flake. The crystals obtained were quite numerous, and vary from half an inch or less to two inches in length, by an inch in breadth. Some are elegant specimens and some could be cut into gems. The hardness is about 7. They are perfectly transparent and remarkably free from flaws, and possess the spodumene pleochroism very markedly. Looked at transversely, they are nearly colorless, or faintly pink; but longitudinally they present a rich pale lavender color, almost amethystine. The characteristic etching is also well developed, especially on the pyramidal faces; but all of the crystals are dun upon the surface and are etched all over as if with a solvent. The crystals are so etched and corroded that the terminals are entirely gone, therefore it is not possible to do very much with them in the crystallographic line. The rounded protuberances and crystallographic points left by the etching are interesting, but it would be exceedingly difficult to make much out of them or to illustrate them. Professor S. L. Penfield kindly measured the prismatic angle on two crystals and reported as follows: “The prism faces were well developed and gave good reflections. The prismatic angle m ∧ m', 110 ∧ 110, on two crystals was found to be 86° 45', from which m ∧ m''', 110 ∧ 110=93° 15'. A prominent feature of these specimens, and also of hiddenite, is the twinning about the a (100) face, and is beautifully shown on the etched crystals where the etching proceeds to the twinning plane and there makes a halt. Aside from differences in color, the fragments of the mineral are remarkably like the etched crystals of hiddenite from North Carolina. The locality brings to mind the famous locality of Branchville, Conn., described by Brush and Dana, but there the gigantic crystals were almost entirely altered to an opaque mineral. 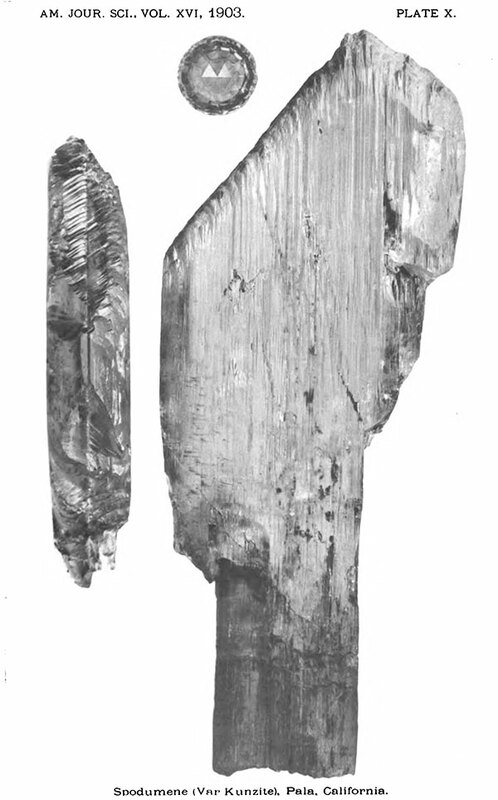 In habit these crystals resemble the spodumene from North Carolina, and for beauty, transparency and great size of perfect material are not equalled by any known locality. If sufficient differences are found to exist between this spodumene and the other known varieties a new name will be given to it. 40 E. 25th St., New York City.